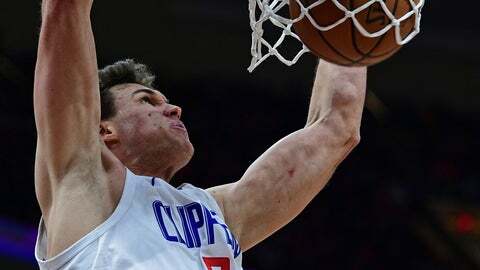 CLEVELAND (AP) — The Los Angeles Clippers‘ latest victory in a torrid March came the hard way. While happy to leave town on a high note, coach Doc Rivers knew his team caught a break Friday night in a 110-108 win over the Cleveland Cavaliers that was in doubt until Jordan Clarkson’s 3-point attempt from the top of the key hit off the back rim as time ran out. Love scored in the lane with 10 seconds left to cut the lead to one before Beverley’s free throw. Los Angeles didn’t lead until early in the third. Beverley’s tip-in midway through the period broke a 73-all tie. The Clippers play their next three games on the road, including a meeting with Milwaukee, which has the league’s best record. Clippers: Gallinari scored 11 of the team’s 24 points in the first quarter. … Montrezl Harrell took an elbow in the face from Sexton in the first quarter, but remained in the game and scored 14 points. … Shamet had 15 points. Cavaliers: G Matthew Dellavedova missed his eighth straight game with a concussion. … Nance, who missed five games with a bruised rib before returning Wednesday, was hit in the chest taking a charge in the second quarter. Love didn’t play Monday after taking a hard fall last Saturday. He returned Wednesday, but banged heads with Milwaukee’s Eric Bledsoe. Love’s problems continued in the second quarter when he was hit in the groin area by Gallinari’s forearm. The five-time All-Star spent a couple of moments on the floor in pain, but stayed in the game. Rivers has kept in contact with Tyronn Lue, who was fired as Cavs head coach on Oct. 28. Lue, an assistant on Rivers’ staff in Boston, has attended a few Clippers’ practices. Lue missed several games last season because he wasn’t feeling well. He coached Cleveland to the NBA title in 2016 and three straight NBA Finals appearances. “OK, what do you guys want to talk about, the Anteaters?” Rivers said as he walked into the interview room.